Uptown circa 2005. Large green boxes: ForestCity's Uptown Apartment complex. Small green box: the park FC built and gave to City of Oakland. Purple: empty lot, which should NOT become a car parking lot!!! Image via google earth. 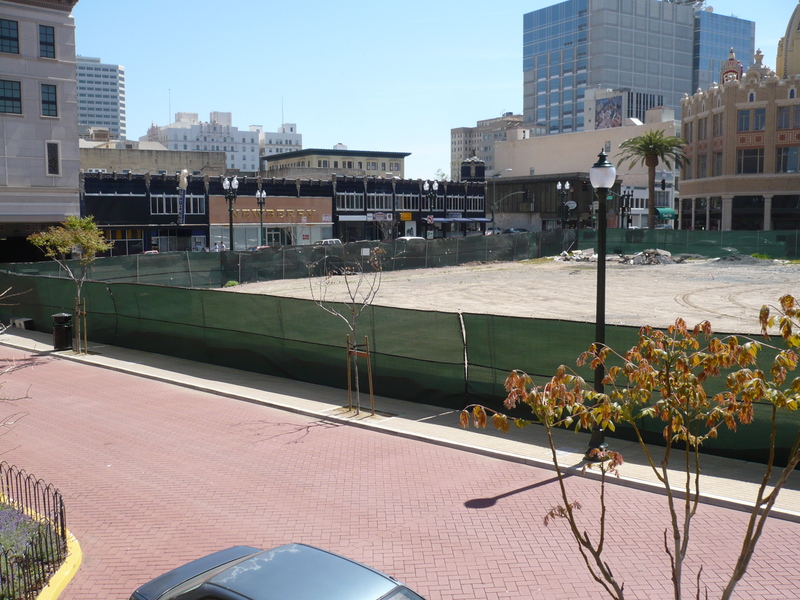 The council is completely against park space — well, hello, look at what removing the Embarcadero Freeway did for San Francisco’s Embacadero district: property values went up 300% after the city tore down the freeway! And now we have the beautiful Ferry Building and whole streetcar-palm tree strip by the bay to enjoy. But I understand this is supposed to become more condos/buildings in 3-10 years from now, so let’s drop the big-park-idea for now. 1/5 lot: Allow area residents to set up a demonstration community garden and temporary park — next to the existing small park. Development is great, but we need more green spaces. As mentioned this area should be next to the existing new public park at Rasheeda Muhammad and William Streets. 1/3 – 1/2 lot: Allow farmers market, prepared food and other vendors to set up a weekly Thursday evening night market. Or perhaps a week-round night market. This will bring in tons of people. Think, SF Chinatown at night. Or better yet Bangkok, Thailand at night. The vendors will pay rent to use this space. 1/2 lot: A little dirt never hurt. Let people play soccer (and other sports) on this dirt field! I played plenty of soccer on dirt fields while living overseas. Email them to complain. And email ForestCity/Uptown to complain. I’ve already sent an email, so now it’s time to call. click pictures for full size version! 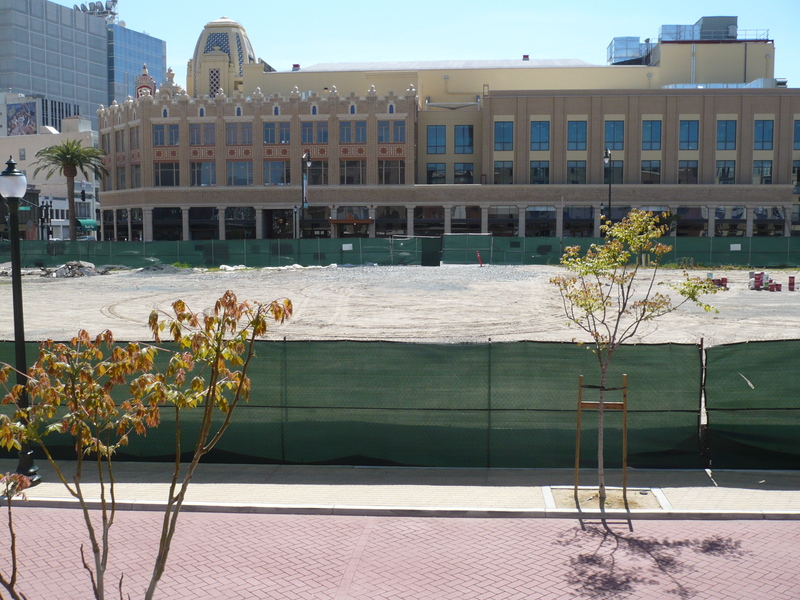 Please do NOT approve of a surface parking lot in the Uptown district. A parking lot would completely ruin a good thing district in this city, which needs all the good residential/commercial districts it can muster. The Uptown Apartments are built on what were three large surface parking lots up until 2007. 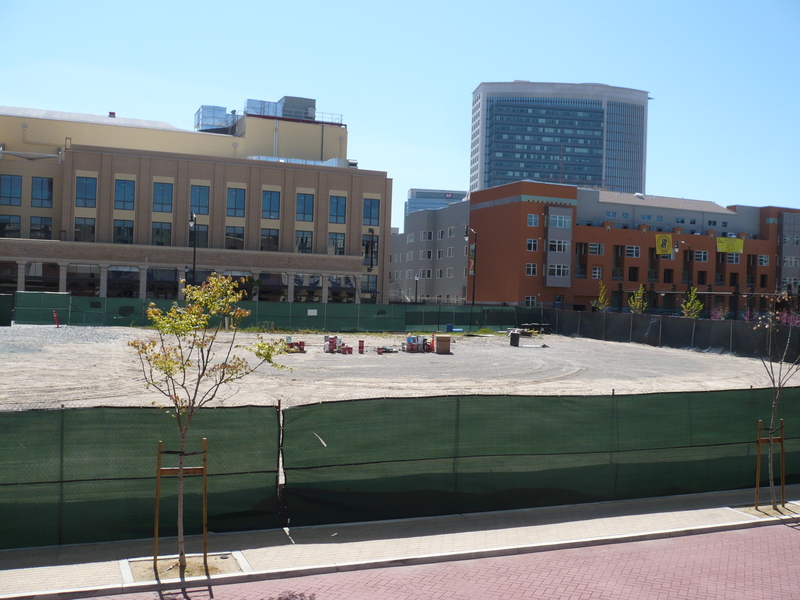 What did these parking lots do for the vitality of the City of Oakland? I would answer: nothing. Look at what is here now. Much better than a parking lot! Been there, done that, we can do better. Thank you for listening and I look forward to your NO vote on ANY automobile parking here now or in the future. If you’d like to know what the community wants, why not hold a design charette in the Uptown district to receive public input? I guess being against car parking spaces is extreme and enviro-wacko of me or anyone else. The sole party to benefit from this would be Sears. Maybe FOX, Flora and Bibliomania too. Old rich white people from Lafayette, Orinda and San Ramon after all, would much prefer to drive here than BART here. And they’ve still got some money. And they can barely walk. You people talking about how we have car parking in the area forget that these city-owned lots are too far away to walk to. People with a suburban/exurban must-drive-my-own-car mentality are only willing to walk at most 1-2 blocks to destinations. Because that’s how it is in Walnut Creek. Or San Ramon. Or Fremont. Or Marin. Park and shop. This entry was posted in Environment O, Local jobs/ Economy/ Startups, Printer Jam Politics, ReDevelopment/Land Use, Transport. Bookmark the permalink. Great email to the Council! Thanks for explaining the problems with surface parking, and summarizing the alternatives. No prob. I just thought of another idea. Down at “Onion Landing” in Union City, there is a faux parachuting experience behind In-n-Out Burger shack. There’s probably a huge fan of doom down below, and it blows you up, simulating a parachute fall. That seems cheap enough to build–although ti’d be torn down. So… how about a year-round carnival, just like I see being set up every so often in Oakland by the Laney flea market or by the car dealers? (or wherever it is.) Carnivals by their nature are temporary. Another idea: set up temp. spaces for all those food vendors to set up, like the family that has a hot dog stand in front of Uptown night club or over by Paramount depending on day of week. Precedents: Pedro’s Brazil Cafe in Berkeley, or the burger joint across from Albany Bowl. How about a temporary bowling alley? How about a Quickly’s pearl milk tea cafe? How about a billiards place? Mmm… the possibilities. Yes, an RFP sounds good, as someone mentioned @ABO. Lease thru 2011, earn money. And, if you can’t come email all the committee members. Emails they got at the last meeting helped convince them to give the Surface Parking Lot proposal a second look.